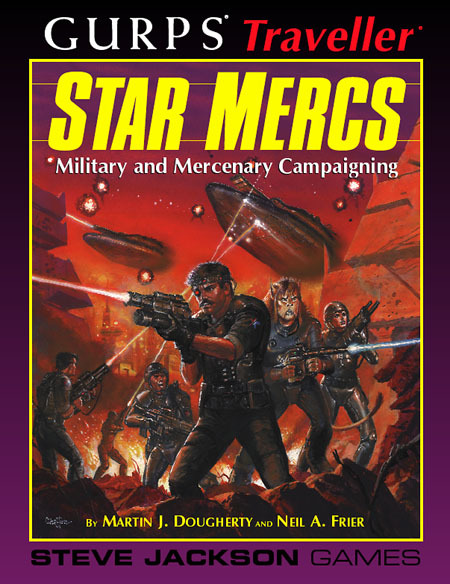 Prepare for War . . .
. . . with Star Mercs. Everything you need for a star-spanning, military-oriented campaign in the Traveller universe is here! Experience combat (and a soldier's life) in the 57th century. Learn how to recruit, organize, and equip a mercenary unit. Familiarize yourself with the Imperial rules of war. Get the edge with discourses on strategy and tactics. Arm your troops from a comprehensive list of weapons and other tools of the soldier's trade. 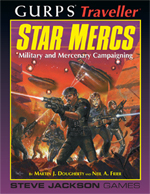 Star Mercs also includes deck plans for the 800-ton Broadsword-class mercenary cruiser, templates for military and mercenary soldier characters, sample missions, and a variety of units and NPC personalities your mercenary group might encounter, including the famed and feared Imperial Marines. Face front, soldier! GURPS Special Ops – Roleplay behind-the-lines strikes, hostage rescue, guerrilla warfare, and other special ops missions. GURPS Traveller: Ground Forces – Holding together an Imperium requires the services of an iron elite, Marines willing to jump from a starship and into the teeth of a planetary defense net, Army troopers willing to travel the universe one slit trench at a time, armor commanders willing to bet their lives that they can get there first with the most.